Chennaiyin FC's search for a win reaches Mumbai as both the teams come against each other at the Mumbai Football Arena this Thursday. Mumbai City FC has been rectifying all the mistakes they had made in the previous season and missing out the semi-final spot. This season, the Islanders have played 9 matches and won 5 apart from drawing 2. Currently, they own 17 points and are 4th on the points table. A win against Chennaiyin can get them a promotion of at least one spot, which would be their primary objective. Chennaiyin FC has been repeating the same story throughout the season. They have played 10 matches, drew twice and won only once. The victory came against Pune City and showed glimpses of a comeback which they couldn't make a reality. At present, Chennaiyin FC are 8th on the table with 5 points and a win wouldn't make any changes to their poor position. 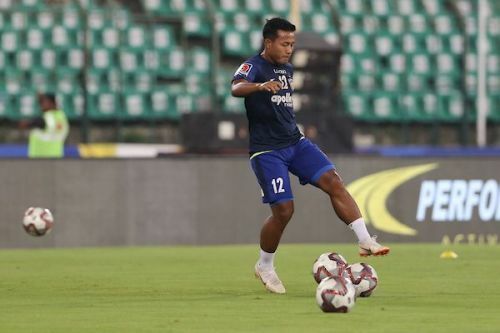 Raynier Fernandes impressed with a goal, after coming on as a substitute against Delhi Dynamos. He is expected to replace Milan Singh in the first XI. Dhanpal Ganesh remains the missing factor at the midfield. Jerry Lalrinzuala might miss out a start, but the replacement will be either Tondonba Singh or Zohmingliana Ralte. Paulo Machado will again become the inevitable part of Jorge Costa's plans. The 32-year old midfielder has been good with his attacks, scoring 1 goal and assisting in other 2. The Portuguese has made valuable contributions with his link-up play with the strikers. Raphael Augusto will take up the midfield general duties for Chennaiyin FC, as usual. The Brazilian is the team's very few consistent performers. Though Augusto is making good crucial passes, the forwards are not able to convert it. The 27-year old who has made 69 passes per game has also scored one goal and an assist. Mumbai City has been going through a good and memorable phase. The team's confidence is at the peak with Costa's plans going well. Chennaiyin FC's struggles are not ending as nothing is going right for them. To get back to the winning ways in such a situation would be a difficult ask for 'The Marina Machans'.